How to change the order of columns in table ? Changing the order of fields in a database is not a function of Base but rather that of the database. This is difficult to accomplish in the HSQLDB embedded DB but easy in Firebird embedded. 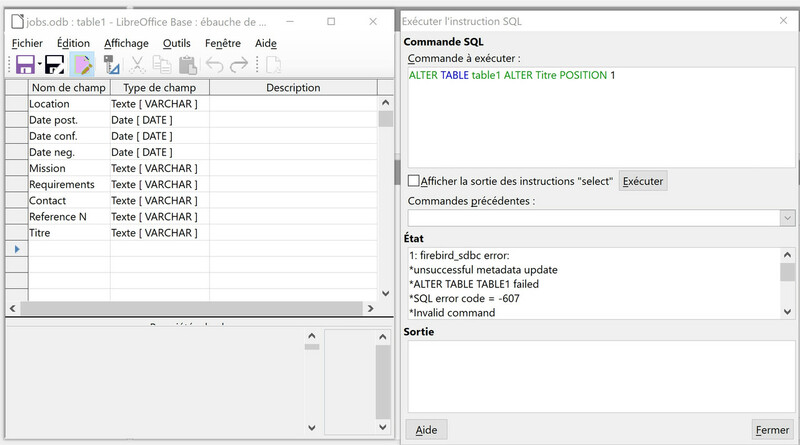 In HSQLDB embedded (default v1.8), it may be best to define a new table with the wanted structure then copy and paste the data from the old table into the new table taking care to match the fields correctly. The POSITION keyword changes the position of an existing column in the notional “left-to-right” layout of the record. Numbering of column positions starts at 1. • If a position number is greater than the number of columns in the table, its new position will be adjusted silently to match the number of columns. Other databases may differ. You have not stated which database you are using. Base itself is not a database but rather a front end to a database. Usually, tables are an "unrelevant" storage medium for record fields. By "unrelevant", I mean you don't process records relying on some implicit convention provided by the DB engine. 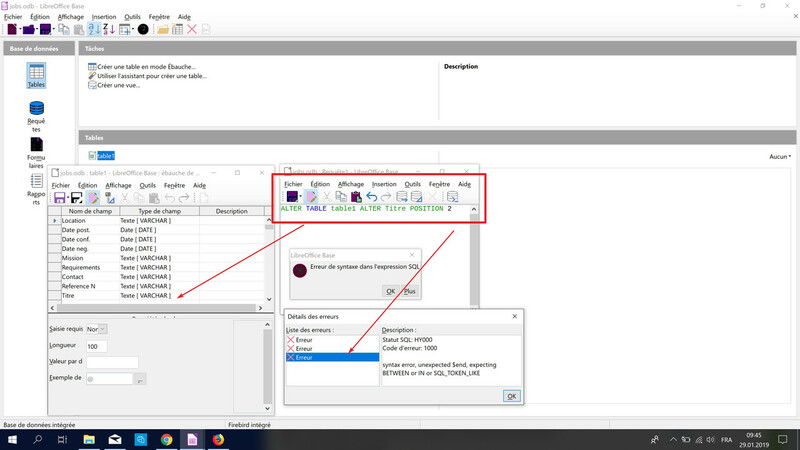 Your fields are accessed through SQL statements which specify which fields will be used for retrieval, then you'll copy the "important" fields to variables or other records. The exact structure of the record, the order of fields does not really matter from a logical point of view. (continued) If you have a single "blob", list it last. Anyway, read the recommendations shipping with the engine. @ajlittoz My comment here allows for 1000 characters. @Pavel_47 Please note there is no Jan here. Jan is a month. Have re-tried this multiple times on Mint18.3 with LO v6.1.4.2 without problems. Possibly a LO Windows version problem. Best to file Bug report. Quotation marks are only necessary depending upon case used and database itself.